NASA is ready to award $1.5 million in prizes next week for robotic rovers that can skillfully navigate mock alien terrain and collect samples all by themselves. Today's robots exploring extraterrestrial landscapes, like the Mars rover Curiosity, have some autonomous capabilities, but they are largely dependent on directions from their handlers on Earth. NASA hopes a little competition will help spark innovations in autonomous navigation that could be used on future missions. Eleven teams are set to participate in the space agency's 2013 Sample Return Robot Challenge, which takes place from June 5 to 7 at the Worcester Polytechnic Institute (WPI) in Worcester, Mass. The rovers in the contest will have to pass rigorous testing to earn prize money. To get through Level 1, the robots will have 30 minutes to search for and retrieve an undamaged mock geological sample — such as a shoe box or tennis ball — that has previously been identified by the robot's computer, NASA officials said. The rovers that can complete that task successfully will move on to Level 2, in which the robots will have to autonomously return at least two undamaged samples to their starting platform within two hours. Awards will be doled out based on the difficulty of the samples collected, with prizes ranging from 100,000 to $1.5 million, according to NASA. In last year's challenge, no prize money was awarded. 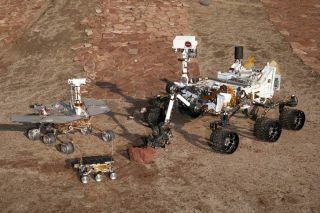 Only one team of six had met the requirements after robot inspections, and that rover failed to make it through Level 1. But NASA officials are hopeful that this year the competition will be fiercer. "We have a lot of new competitors signed up," Sam Ortega, program manager of Centennial Challenges, which is managed by NASA's Marshall Space Flight Center in Huntsville, Ala., said in a statement. "Improving this technology will be a huge boon, not just to NASA and space exploration, but also for countless applications here on Earth." The list of returning teams includes SpacePRIDE of Graniteville, S.C.; Survey of Los Angeles; Wunderkammer of Topanga, Calif.; Intrepid of Lynnwood, Wash.; and the University of Waterloo in Ontario, Canada. The newbie competitors are: Fetch of Alexandria, Va.; Middleman of Dunedin, Fla.; Mystic Late Robots of The Woodlands, Texas; Team AERO of Worcester, Mass. ; the Autonomous Rover Team of the University of California at Santa Cruz; and Kuukuglur of Estonia.